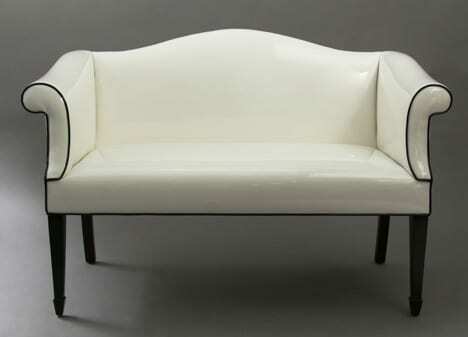 The White Street Settee from Duane Modern features traditional styling that has been transformed with a touch of modernism. The cool thing is that this piece is now more transitional where it can fit into a modern home or a traditionally decorated home. I can see this gracing the parlor of Southern home or in a formal living room and then on the other hand, working in an upscale modern loft apartment. Upholstered in white with a black trim, this color combination creates many opportunities for mixing and matching with other pieces of furniture. The satin finish provides an extra element moving away from its traditional roots and creating opportunities for a modern enthusiast. Measurements: 22″ x 49″ x 33″. Price: $3,600.